Heat oil in Dutch oven over medium heat until hot. Add pork, carrots and onions; cook until pork is browned. Drain. Add potatoes, bouillon, pork seasoning, vinegar and 4 cups of the water; mix well. Simmer 30 minutes, stirring occasionally. In small bowl, combine remaining 1/4 cup water and flour; beat with wire whisk until well blended. Add flour mixture and cabbage to stew; mix well. Cover; simmer an additional 10 minutes or until stew is thickened, stirring occasionally. 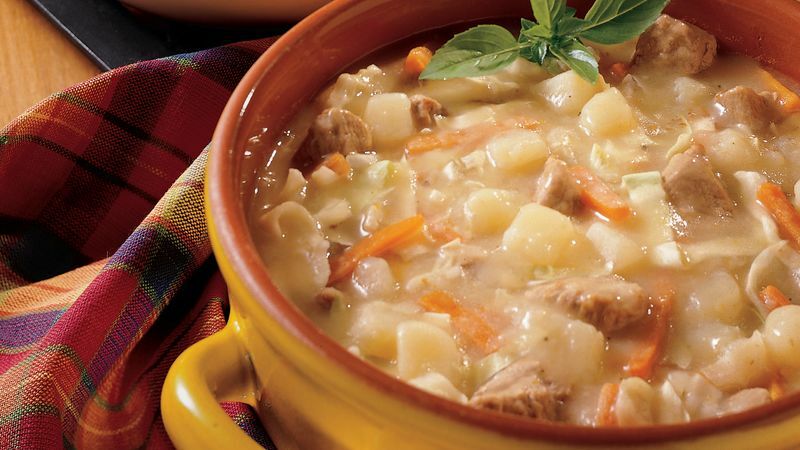 Combination dishes (soups, stews, casseroles) that contain potatoes freeze with varying degrees of success. The potato pieces may discolor or lose their texture. You can try to get around this by omitting the potatoes when preparing the dish to be frozen, then adding potatoes during reheating. Canned Irish potatoes retian their texture and can sometimes be substituted in soup and stew recipes.